The East Asian Collection holds our collections in the Chinese, Japanese, and Korean languages. It is located on the 5th floor of UCSB Library. Created in 1967, the East Asian Collection supports the research and curriculum of the East Asian Language and Cultural Studies Program at UCSB. East Asian Bibliography Room: This area includes current periodicals in Chinese, Japanese and Korean (except newspapers, which are in the Current Serials area on the 2nd floor). In addition, the most frequently-used reference works for the East Asian Collection are located here. Stacks: The majority of the collection is stored in the East Asian Collection stacks (or bookshelves) located in the west end of the floor. Oversized books are shelved at the beginning of the stacks. Research assistance is available in the East Asian Collections Offices located behind the elevators. We are available to help you weekdays from 8 am to 5 pm. Main Desk: When the East Asian Collection staff is not available, you can ask for assistance at the main reference desk on the 1st floor. There are 5 public computers in the lobby of the East Asian Collection. Print release station #8 is located in this area. 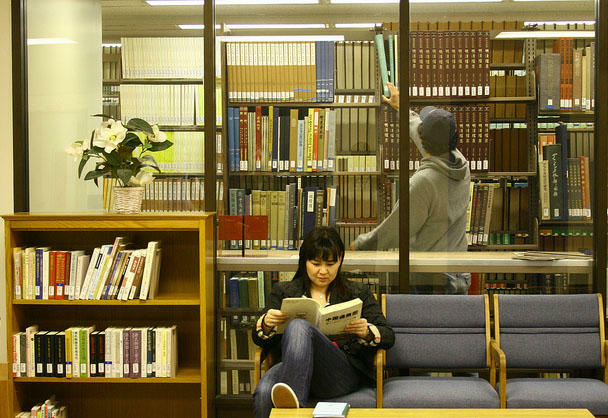 Most of the study space in the East Asian Collection is located in the lobby and in the East Asian Bibliography Room. Group Study/Conference Room is located behind the elevators; priority is given to classes and conferences.